USA Cycling's junior women's team needed a race, and the only one on the calendar was a men's kermesse in Belgium. 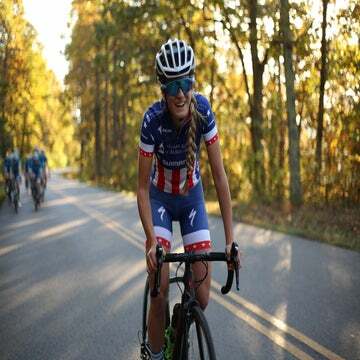 SITTARD, Netherlands (VN) — The results of the race may soon fade into obscurity, but the memories of the action will stay with USA Cycling’s junior women’s team forever. This past Saturday, the team drove from USA Cycling’s home base here in this Dutch town across the border into Belgium, to compete in a local kermesse in the town of Zutendaal. The six members of the squad — Megan Jastrab, Ava Sykes, Zoe Ta-Perez, Katie Clouse, Jane Tullis, and Gabrielle Lehnert — prepared themselves for a day of aggressive and chaotic action. The race featured no official women’s category. So, the team entered the men’s race. A gap existed in the women’s schedule prior to this weekend’s Healthy Aging Tour, and Pierce saw the kermesse as a valuable learning opportunity. These junior men’s races often feature unpredictable action. The teenagers lack the cohesion to execute complex strategic maneuvers and instead spend much of the race attacking each other around every turn. Placing female riders into male races isn’t unheard of within Europe’s development leagues, but it is rare. The UCI permits the practice so long as the junior women race one age group below their own. Thus, the junior American women, all of whom are in the 17-18 age group, competed in the junior men’s 15-16 race. Ta-Perez said the team received an icy welcome when they rolled up to the starting line. The race was comprised of 10 laps around a 6.8km circuit, and the loop included plenty of twists and turns, as well as two hills. There were 82 total competitors in the event, which is a much larger field than junior women see when racing in the United States. From the gun, riders said that the racing style was far different from what they see in junior women’s races. There were no lulls in the action — the junior boys launched constant attacks off the front of the field. The peloton lurched as it navigated the corners, as many of the boys struggled to coast through the turns without braking. Yet the junior women rolled with the constant punches. By the race’s midpoint, Jastrab, Ta-Perez, and Clouse had ridden themselves to the front of the pack. They took turns counter-attacking when each breakaway was eventually reeled in. And as the race approached the finale, the girls organized themselves to set up Jastrab, their sprinter, for the finale. The race allowed them to improve on their performance at the recent Gent-Wevelgem junior women’s race. At that race, British rider Elynor Backstedt — daughter of Paris-Roubaix winner Magnus — had launched a solo breakaway in the final kilometers. The American women had tried to bring Backstedt back. However, their chase was disorganized. Backstedt won, while Jastrab took the sprint for second. After the race, the team discussed their miscue. Now, at the men’s kermesse, the women were given another chance. A Belgian rider sprung off the front with two laps remaining, and the Americans amassed at the front to try and bring him back. At Gent-Wevelgem, the women had taken long pulls on the front, and then faded back to rest. At Zuttendal, they cycled through with shorter turns. Elbows bumped in the chaotic finale, and the breakaway rider stayed away. As the group rumbled toward the finish, Jastrab launched her sprint with 150 meters to go. In the final charge to the line, a Belgian rider pipped her. Jastrab was third out of 82 riders. The Belgian boys were impressed. “They were really nice to me on the podium,” Jastrab said. The anonymous Belgian race marks another stepping stone in the years-long pathway from the junior to the professional ranks. 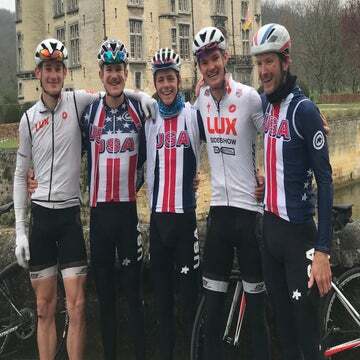 Every year, USA Cycling’s development program brings more talented youngsters over to the Low Countries in hopes that the breakneck races on narrow lanes teach them how to compete as professionals. It’s a long, sometimes painful process. And every race, it seems, counts.